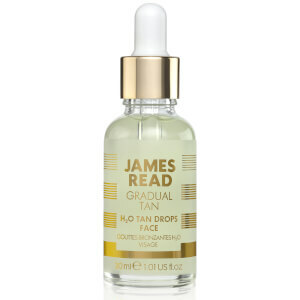 Achieve glowing perfection with the James Read H2O Face Drops; a water-based formula that works with your daily skincare products to promote a radiant, flawless visage. Enriched with Aloe Vera and Hyaluronic Acid, the gradual tan drops can be added to moisturiser, serum or foundation to enhance your complexion without streaking or clogging pores. Features a unique dropper applicator that allows you to control colour; simply increase the dosage for a deeper tan. 1. Mix 1-4 drops to your usual moisturiser, lotion or cream in the palm of your hand. 2. Apply evenly over the face in your usual manner. 3. Increasing the dosage will increase the depth of colour. Aqua (Water), Dihydroxyacetone, Erythrulose, Glycerin, PEG-40 Hydrogenated Castor Oil, Rosa Damascena Flower Water, Aloe Barbadensis (Aloe Vera) Leaf Juice, Xanthan Gum, Citric Acid, Sodium Metabisulfite, Parfum (Fragrance), Tocopheryl Acetate, Sodium Hyaluronate, Sodium Benzoate, Potassium Sorbate, Linalool, Coumarin, Alpha-Isomethyl Ionone, Benzyl Salicylate, Citronellol, Butylphenyl Methylpropional, Hexyl Cinnamal.